No matter which body of water they hail from, all lobsters belong to the marine class of invertebrates known as crustaceans, as do shrimp and crabs. Lobsters are all bottom-feeding omnivores who dine primarily on mollusks. They all have poor vision, a keen sense of smell and 10 legs. There are a few differences between warm and cold-water lobsters, including geographical range, social habit and notable differences in appearance. American and European lobsters are cold-water specimens and found throughout the northern Atlantic Ocean. Along the North American coast, they range from Labrador, Canada to the state of North Carolina, with the densest population residing off the coast of Maine. Conversely, the Caribbean spiny lobster is a warm-water lobster found in the southwestern Atlantic Ocean from North Carolina and Bermuda to the Caribbean region, the Gulf of Mexico and along Brazil and Rio de Janeiro. Another warm-water lobster, the California spiny lobster, swims the waters along the Pacific coast from Monterey, California south to the Baja, California peninsula near Mexico. Cold-water lobsters are solitary by nature, dwelling among the rocks during the day and venturing out in search of food at night. During mating season, cold-water lobsters adhere to a social hierarchy in which the highest-ranking male will mate with multiple females in his solitary abode. Warm-water lobsters share their coral reef homes with one another. When it is time to seek out more temperate waters or more a plentiful food supply, large groups of the warm-water spiny lobsters embark on mass migrations together, and they will warn one another of impending danger by rubbing their antennae on the bases of their eyes to sound alarm. Cold-water lobsters are typically black or brown with a greenish tint. The only time that you will see a red cold-water lobster is when it appears on a dinner table after the cooking process results in the scarlet pigment change. The warm-water spiny lobster’s natural hues are more ornate and colorful. Exhibiting a purple shade during their youth, their adult colors are red or blue with spots on their tails and stripes on their legs and tail fans. Cold-water lobsters are typically longer and heavier in size than the warm-water spiny lobsters. All lobsters have 10 legs, but the most apparent difference between warm and cold-water lobsters is the presence or absence of large claws on the front-most pair legs. Cold-water lobsters are equipped with a pair of claws that are each designed for a different purpose. 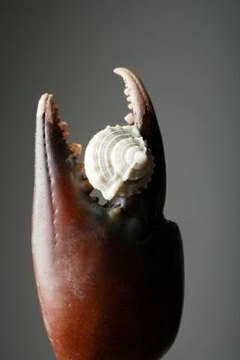 The larger claw has wide, thick teeth for crushing mollusk shells. The other claw is slightly smaller, with sharper teeth for tearing flesh. Warm-water lobsters do not have these claws. Instead, they use their front appendages to pull food toward their mouths, crushing the shells of mollusks and snails with their mandibles. The spiny lobster also relies on the spikes that cover its body for defense. The next time you ponder where a lobster comes from, look for the claws to find your answer. What Are the Functions of the Hairs on a Shrimp's Legs?